Water intrusion can cause a host of issues impacting buildings and the health of the people who use them. Hospitals and other medical facilities must be particularly aware of this sometimes-invisible threat to protect the vulnerable populations they serve. Whether it’s visible or not, in a newly-built or older facility, water and water vapor can be the root cause of fungal growth, deterioration of building components, and of physical symptoms in people. Moisture intrusion on building materials may lead to increased levels of fungi and create an environment for growth of different fungal species. Additionally, construction activities that disturb building materials that have been colonized can also cause higher levels of fungi in the indoor air. Any type of water intrusion that causes mold growth can lead to problems with indoor air quality and cause symptoms in building occupants. While medical staff can commonly experience more allergy symptoms, patients with compromised immune systems or who are critically ill, can experience severe, and even life-threatening illness when exposed to such an environment. Aspergillosis, in particular, caused by exposure to Aspergillus fumigatus and other Aspergillus species, is a well-known disease concern in healthcare settings where immunocompromised patients are exposed. Finding the cause of water intrusion and fixing it correctly makes the difference in providing healthcare consumers with the safe environments they expect. 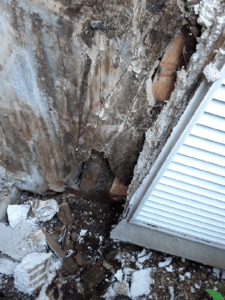 What do you do if you suspect a water intrusion issue? Start by asking whether there is obvious evidence of moisture and whether health impacts are being experienced. 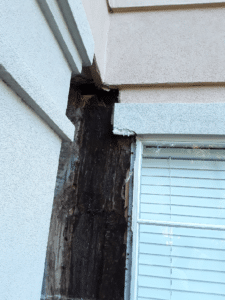 If a building is experiencing leaks that can be seen, it may be traced to a failure of sealants or improperly installed flashing for windows, walls, roofing components, HVAC penetrations, or another item. It’s important that these more obvious causes be addressed correctly so water intrusion problems don’t continue or reoccur.. Buildings that have recurrent issues with leaks often have maintenance issues that need attention. Less-obvious types of moisture intrusion such as water vapor and condensation within walls or behind wall coverings are typically more difficult to diagnose and discover. Certified industrial hygienists and building engineers that specialize in building enclosures can track down the sources of water intrusion and evaluate the building environment so that the building can be successfully repaired and remediated to protect occupants. While it can seem overwhelming to find and fix water intrusion issues in a healthcare facility, Terracon can help. Our team of facilities engineers and industrial hygienists have conducted large and small scope investigations and have experience in resolving complex moisture intrusion problems. Mike Crandall, CIH, is a senior industrial hygienist in the Terracon Phoenix office. He has 40 years of experience in industrial hygiene and building investigations, working with residential, commercial, and institutional clients.